1509-1547. Left to right: Testoon (12/-), Groat, Halfgroat, Halfpenny. The Testoon is the forerunner of the Shilling. 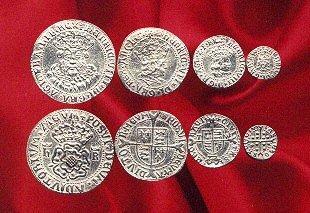 The Groat is from the reign of Henry VII as these coins were still minted in the early years of the reign of Henry VIII.